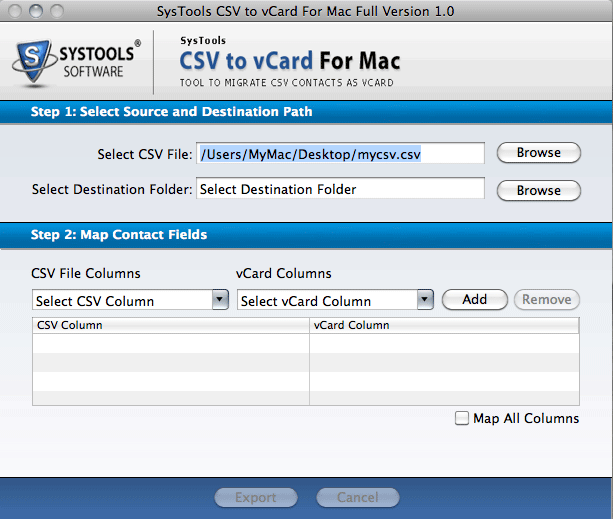 The MacWareTools CSV file converter allow you to export multiple contacts from CSV file to vCard (.vcf) file format. The Software creates a single vCard file for each contact saved in CSV File. While converting from CSV file to vCard, the software allow you to map CSV Columns with VCF Columns and export the data according to the respective fields. Although you can manually select and map the contacts fields in software, But for large files the manual mapping is time consuming. 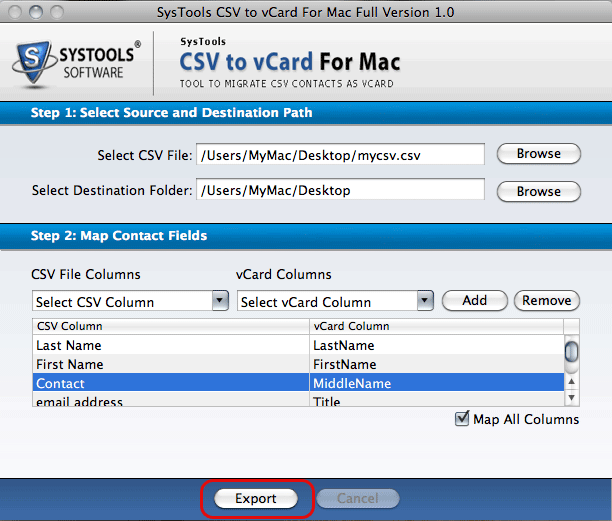 Hence, MacWareTools CSV to vCard allows you to automatically map all the columns by checking "Map All Columns" option in the software before export clicking on export. This MAC CSV to VCF converter built in a such manner that you just need to add CSV file to the software and the easy interface of the software lets you convert CSV file quickly without any hassle. The process takes two steps in conversion of CSV contacts to vCard. Once the CSV file Added to the software for conversion, you just need to provide a destination location to export the converted vCard file. I am much impressed with the working of this CSV file to vCard converter, As the software performs quick conversion from CSV to VCF file. Also the GUI is very easy for non-technical users. We were facing a major problem in importing CSV file in Icloud, But this CSV to VCF converter has done a very good job and made the importing process easier for us. Thanks to developers for building such a great tool for fast conversion of CSV contacts to vCard. The Auto mapping of columns between CSV and vCard saves my too much time when I am in a hurry. I was tired of searching for a manual method to convert CSV contacts to vCard format as I need to import the vCard into my smartphone. Then, I found this tool. Within a few minutes, I get all my work done even without any difficulty. Now, I am confident enough that I can alone perform the conversion task. Thank you, developers for designing such an eminent utility. I am lucky to have such a useful software to converting CSV file. I am in IT industry for more than 15 years. I have never seen such an incredible utility for the conversion propose. I have performed bulk conversion with the help of this modern application. I want to say a big Thanks to the whole team behind this innovative idea. I would like to suggest the same utility to every user out there. 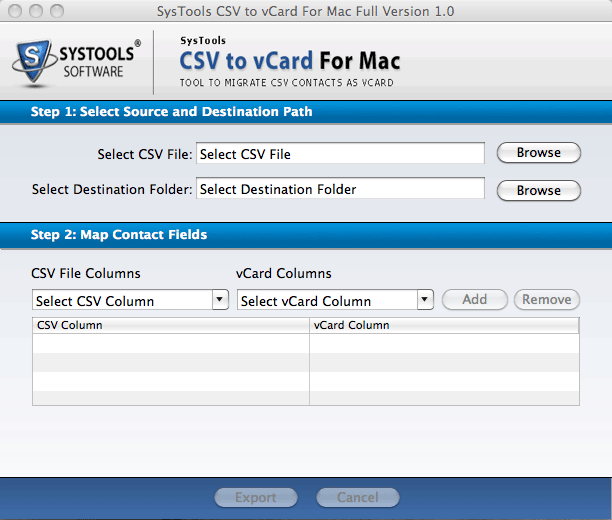 The Demo version of the software enables you to export first 15 CSV contacts to vCard on MAC. How to Convert CSV to VCF on MAC? Is there any file size limitation for Conversion of CSV file? No, Software doesn't impose any file size limitation for conversion of CSV contacts to VCF file format. Does this software run on MAC OS 10.13? No, Software supports to run on MAC OS 10.13, 10.12, 10.11, 10.10, 10.9, 10.8, 10.7 & 10.6 and converts CSV file to VCF. Does this software perform Auto mapping of Columns? Yes, Software allows you to perform auto mapping between CSV and vCard Columns.